Every Pet Owner Should Have A Shedding Tool The Majority of Pets Shed, and they shed all year. depends upon their health and breed type. pet's fur can become clumped and matted. The best way to control it, is you doing the shedding. natural shedding by up to 90%. for potential signs of problems such as skin conditions or parasites. bonding experience for you and your pet. simply comb through your pets hair a few times and let the tool do the work. and the tool will eject the hair into your garbage can. "The best shedding tool ever. After buying quite a bit of shedding tools (even the expensive one). Zampa is the very best. Don't look any further; get this tool"
ERGONOMICALLY DESIGN This pet shedding tool has a 4" wide blade great for medium size dogs & cats. Made from supreme quality stainless steel. Strong and unbreakable. Introducing the INCREDIBLE GRIP for comfortable and smooth shedding, And an amazing Ejector so your house don't get messy. RESULTS Dramatically removes up to 90% of its hair without hassle. This shedding tool works for short or long hair, with single and double coats. RECOMMENDED by Vets and HUNDREDS of our customers. This pet grooming tool dose a WONDERFULL job. ZAMPA GUARANTEE; As much as we love pets, we want our customers to be satisfied with their purchase. This Pet Shedding Tool comes with a ONE YEAR guarantee. So there is NO RISK on our Pet deshedding tool. If that is not what you wanted. We exchange or refund you on your request. 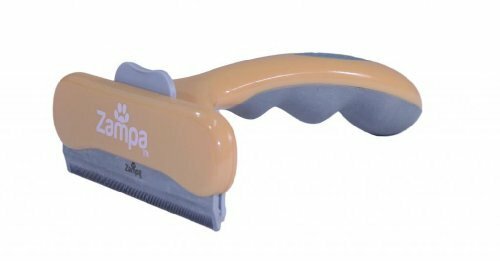 70% OFF This shedding tool is the BEST experience you will get grooming your pet. Now its ON SALE. So ACT NOW before price increases. Deshedding Tool for Dogs and Cats. Comfortable Silica Gel Handle and Removable Stainless Steel Blades For Easy Cleaning. Reduces Pet's Shedding by 90% So Your Floors And Furniture Stay Clean!